Servicing all cars, trucks, RVs, and classic cars. 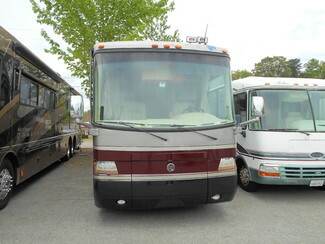 This is a 2003 Holiday Rambler Imperial 40PST. The interior is in great condition and has not been used much. The coach only has 19500 miles on the engine and is barely broken in. It is ready for a long trip and has been checked over at our shop for maintenance and repairs. This unit has just had some maintenance upgrades including two brand new roof air conditioning units, a new roof seal, new propane tank gauge, and a new HVAC control panel. Invested over $14,500 in recent upgrades and maintenance that adds value and continues the proper running of the quality, feature-packed, low-mileage, 40-foot heavy duty 400hp diesel pusher RV. There are some scrapes and dings on the side of the coach, but no structural damage.